I started off my formal study in Islamic Finance by registering into IIUM Post Grad Diploma in Islamic Banking and Finance at the International Islamic University Malaysia. It was a two year program for part time students. The classes were conducted on Saturdays and most students took two subjects per semester. We were given basic exposures of Islamic Economics and Islamic Jurisprudence before taking Islamic Finance courses. One of the concepts that I learned and still remember very well is Islam, its Worldview and Economics. I started the program in 2008 and completed in 2010. 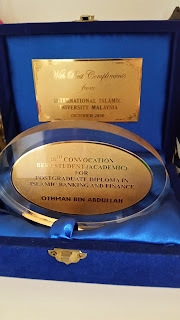 I was awarded Best Student (Academic)!